For the women who has everything…absolutely delightful! 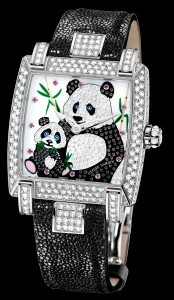 It is 18K white gold case with a playful image of mother and baby panda. Black and white diamonds are set onto the dial and white gold case, exhibition case back. It is available on a stingray strap with 18K white gold folding buckle.